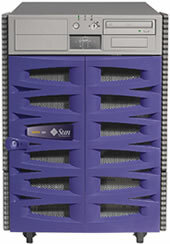 ﻿ SUN UNIX server maintenance services (such as: Sun E250, 420R, E450, Blade100, Blade1000, Sun Fire V210, V240, V280R, V440, V480, V490, V880, V890, Sun Netra T4 TEL:(8610)82666745 | www.chinama.com.cn | Beijing dark blue Rong Xin Technology Development Ltd.
SUN UNIX server accessories sales. 1）SUN UNIX server maintenance professional models are: Sun Enterprise 250, SunEnterprise 420R, Ultra Enterprise 450, Sun Blade 100, Sun Blade 1000, Sun Fire V210, Sun Fire V240, Sun Fire 240, Sun Fire V280R, Sun Netra T4, Sun Fire V440 , Sun Fire V480, Sun Fire V490, Sun Fire V880, Sun Fire V890 such as SUN UNIX servers. 2) I have many years of professional companies SUN UNIX server maintenance, the engineers, the engineers SUN family of products are very familiar with. Have good technical knowledge and technical communication skills. 2) my company, the engineers, according to provide hardware fault information to determine hardware failures. 4) engineers hardware solution, it can provide the corresponding test accessories, such as power supply, or SUN UNIX server motherboard, memory, hard disk and so on, I test in accordance with specific spare parts, to collect certain parts of test fees. Case 1, Beijing Enterprises Sun Enterprise 250 UNIX servers bad, a company of engineers and accessories diagnostic tests, the results of E250 is a bad power supply, replacement power, the machine will start the normal machinery, maintenance success. Second case, a Beijing SME Enterprise 450 UNIX servers bad, a company of engineers and accessories diagnostic tests, the replacement of fan accessories, machines can be activated normal machinery, maintenance success. Case III, a Beijing SME Enterprise 3500 UNIX servers bad, the company engineers and accessories diagnostic tests, the replacement of fan accessories, the machine can be activated normal machinery, maintenance success. 案Four cases, small and medium-sized enterprises in a city that the Sun Fire 220 UNIX servers bad, a company of engineers and accessories diagnostic testing, replacement parts, the machine can be activated normal machinery, maintenance success. Case 5, a Beijing SME Sun Fire V440 UNIX server bad, the company engineers and accessories diagnostic tests, the replacement of damaged parts, the machine can be activated normal machinery, maintenance success. Case 6, a Beijing SME Sun Fire V480 UNIX server bad, the company engineers and accessories diagnostic tests, the replacement of damaged parts, the machine can be activated normal machinery, maintenance success. Case 7, a Beijing SME Sun Fire V880 UNIX server bad, the company engineers and accessories diagnostic tests, the replacement of damaged parts, the machine can be activated normal machinery, maintenance success.